The MongoDB database is designed to be resilient and gives you several options for high availability and business continuity. But what about encryption key management - how do we implement high availability when we’ve deployed a key management system for MongoDB encrypted databases? Here at Townsend Security we encounter this question with MongoDB users on a regular basis. Let me share some of the approaches that we recommend. 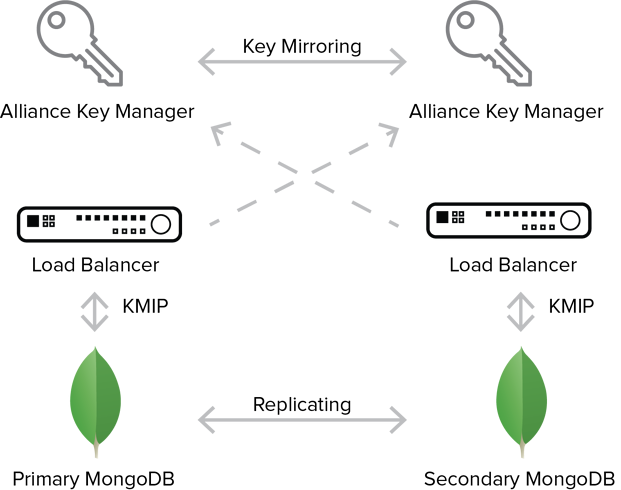 In this case we deploy a single key manager to serve both the primary and secondary nodes of a MongoDB implementation. After initializing the MongoDB database for encryption, we perform a key manager backup to archive the master encryption key for the primary and secondary nodes of the database. Recovery of the MongoDB database may involve migration from the secondary node to the primary node when it is back online, or restoration from a backup image, and a restore operation for the key manager. Alliance Key Manager makes it easy to backup the encryption key database and configuration, and to restore from backup when needed. This is the simplest case of key management recovery when hot failover is not needed. Remember to follow security best practices when backing up Alliance Key Manager. You will want to save the secret keys separately from the data encryption keys, and ensure separation of duties. See the Alliance Key Manager documentation for guidance on backup and restore operations. The primary MongoDB node has a key manager deployed in its data center or cloud location, and the secondary MongoDB node has a different key manager deployed in its data center or cloud location. The two key managers are mirroring encryption keys in real time in an active-active configuration. Both the MongoDB data and the Alliance Key Manager instances are fully redundant in real time. With a load balancer placed between the MongoDB database and the two key managers you can achieve hot failover in the event of a lost connection to the first key server without loss of access to the database. When the connection to the main key server is restarted the load balancer will bring it on line. The two Alliance Key Management servers automatically mirror encryption keys to each other in an active-active configuration. In the event of a full loss of the primary MongoDB database the failover to the secondary MongoDB database will occur by the MongoDB Arbiter. The fully replicated data will be available and the secondary database will be protected by a pair of Alliance Key Manager servers in the same was as the primary MongoDB database. Note that there can be multiple secondary MongoDB nodes and each can implement a similar key management failover strategy. With the above strategy MongoDB database customers can achieve a very high level of business continuity and high availability failover. MongoDB database deployments vary a great deal in their overall architecture and implementation. This is a testament to the flexibility of the database and its ability to meet a wide variety of customer use case scenarios. 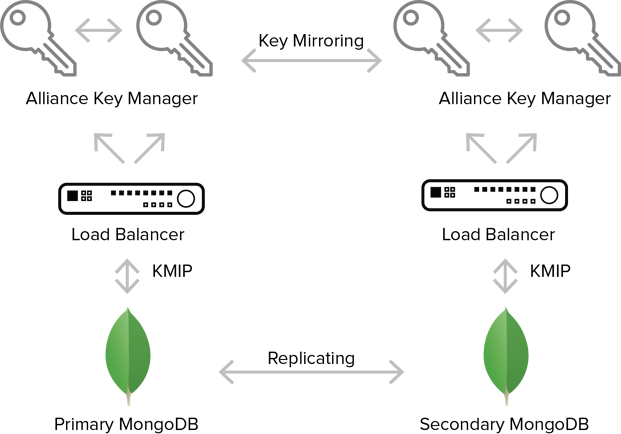 Alliance Key Manager for MongoDB can help improve security and recoverability in any MongoDB deployment. Alliance Key Manager is available has a Hardware Security Module (HSM), VMware software appliance (virtual machine), and as cloud instances. The interface to all of the key managers works in exactly the same way. This means you can create hybrid deployments of MongoDB and Alliance Key Manager across clouds, and between cloud and on-premise deployments. At the time this blog was written (March 2018) the MongoDB Atlas cloud platform did not support independent third party key management solutions through the KMIP interface. That is likely to change in the future. 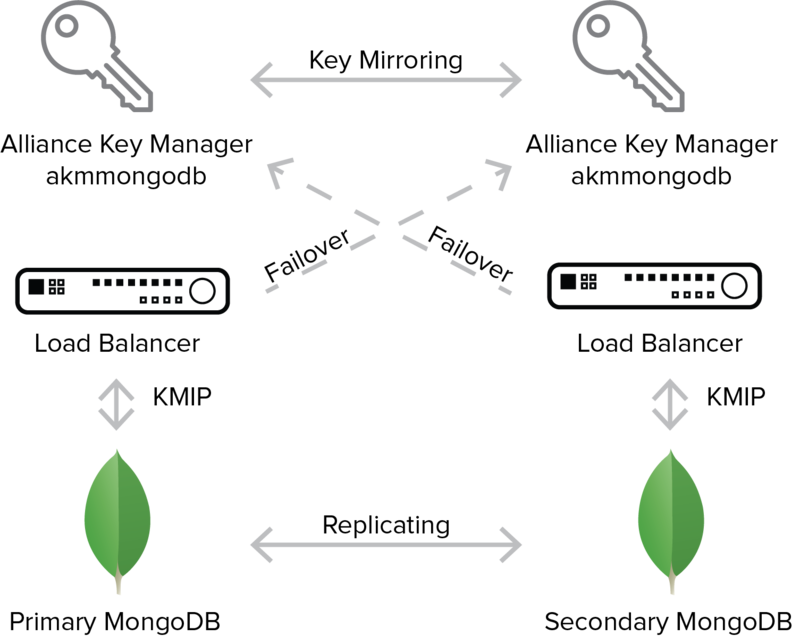 For Enterprise customers who must achieve exclusive custody of encryption keys, you can deploy MongoDB in a normal cloud instance and use the encryption and key management capabilities of MongoDB with Alliance Key Manager. You can then migrate to the Atlas service when it supports the KMIP interface for key management. Alliance Key Manager for MongoDB is certified by the MongoDB security team, and supports the MongoDB Enterprise pricing model. Regardless of the size of your MongoDB implementation you will find an affordable and easy-to-deploy Alliance Key Manager for MongoDB solution. We’ve had support for MongoDB encryption key management for some months now, and the conference in San Francisco last week was a real delight. This is an amazing community of developers and users who are innovating and creating new applications based on MongoDB at a rapid pace. I was happy to give the security session on encryption key management for MongoDB and it was a great success. You can find a replay here. Database development has the reputation of being difficult and requiring extensive expertise. But I met a lot of people who have developed MongoDB databases without much or any database administrative knowledge. For example, I talked to a young scientist (that was the title on her badge) who was not in an IT group at all. She had developed a MongoDB database to store and analyze genetics information from her genome sequencing project. I met a pair of IT administrators from a property management company who had developed three applications on MongoDB because their development team had a long backlog of projects. They were in the network administration group and did not have formal experience with database development, but they built applications in a short period of time. It’s truly amazing to see sophisticated applications being developed by users! Before last week I thought of MongoDB as a big data repository for documents and IoT data. It is that, but it is a lot more. Many of the professionals I talked to at the conference were using MongoDB the way you would use a normal relational database like SQL Server, Oracle, DB2 or MySQL. I had the definite sense that MongoDB has found a way to bridge the worlds of relational databases and unstructured big data repositories. MongoDB users told me that the APIs and toolsets let them do almost anything they wanted to do. Well, MongoDB really is a great repository for big data. I talked to a number of larger enterprises from the San Francisco Bay Area who are storing extremely large amounts of data in MongoDB databases. Medical, IoT sensor data, financial data, customer service data and other types of data from a variety of data sources are being collected in MongoDB for business operations support and business analytics. The scalability of MongoDB is truly impressive. Sensitive Data is Going into Almost All MongoDB Databases!!! The other thing I learned is that an awful lot of sensitive data is being stored in MongoDB. The database is very flexible, and so there tend to be a lot of data feeds into the database. And those database feeds can include sensitive data that the MongoDB developers do not know about. I heard stories about MongoDB developers being surprised to find credit card numbers, social security numbers, email addresses, medical data and a lot of personally identifiable information (PII) being stored in the database. MongoDB developers are really aware of the risks of sensitive data in the database. And they were hungry for information on how to protect it. Fortunately MongoDB Enterprise makes it incredibly easy to implement encryption and key management. In my session I was able to show how you can enable encryption in MongoDB with just a few commands. Customers upgrading from the open source Community Edition of MongoDB get access to this encryption facility and it is a delight. 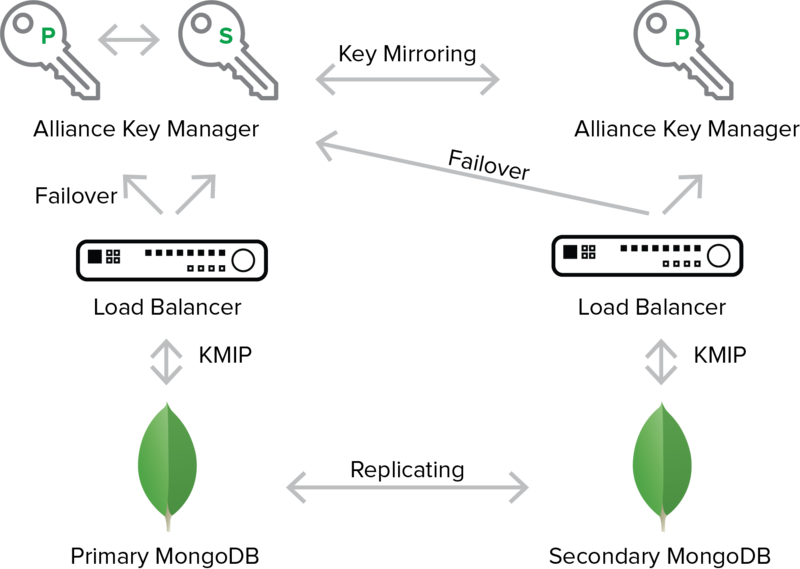 I’ve been impressed with the MongoDB implementation of encryption and key management from the start. First, MongoDB stepped up and implemented encryption right in the MongoDB database. There is no need for any third party file or folder encryption product to sit under the database. The encryption in MongoDB is based on industry standards (256-bit AES) and is tuned for performance. This is exactly what you want - your database vendor taking responsibility for encryption and owning the performance profile. MongoDB also got the encryption key management part right. They based the key management interface on the open OASIS standard Key Management Interoperability Protocol (KMIP) in order to immediately support a broader community of key management vendors. That made it easier for us to certify our key management solution, Alliance Key Manager, for the MongoDB Enterprise platform. We are happy to support both Intel and POWER chip architectures for MongoDB deployments. Lastly, just a personal note. I met a lot of MongoDB staff and managers at the conference. What a great bunch of people. They were energized and positive about what they are doing. Every company has its own character, and I found myself happy that we were engaged with this group of people. Encryption key management is the cornerstone of an effective encryption strategy. Without key management, encryption stands alone as only half of a solution. When you leave the keys to unlock your sensitive business and customer data exposed, then you expose your entire organization to the risk of data loss or theft. Luckily, MongoDB was born in the age of modern data security and developed their no-SQL database with the forethought and insight to incorporate strong encryption and key management solutions. 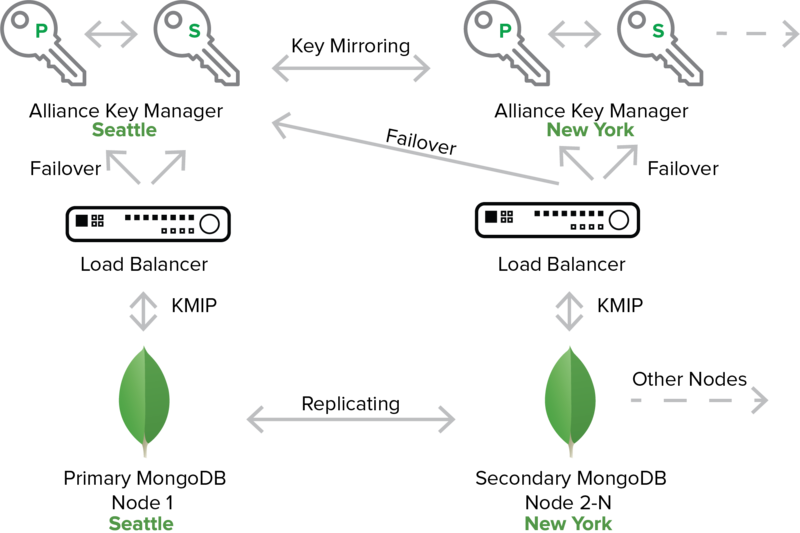 This means that today, with MongoDB Enterprise, MongoDB customers can meet encryption and key management best practices fairly easily through implementing native encryption and deploying a third-party enterprise key management solution. In order to enable customers to seamlessly implement enterprise encryption key management, MongoDB integrated a universal encryption key management protocol called the Key Management Interoperability Protocol (KMIP). Unlike many other legacy databases who have floundered over the years trying to help customers do strong key management, MongoDB enables customers to protect encryption keys out of the door with a number of tested and validated enterprise key management partners. To know if you’re encryption key management solution is compatible with MongoDB, check to see that it has implemented KMIP. What is Enterprise Encryption Key Management? Enterprise encryption key management includes both technological and policy-based controls that integrate to provide the highest level of security of an organization’s encryption keys. Both types of controls are important to protecting encryption keys. On a technological and physical level, encryption keys should be stored in a logically or physically separate hardware or virtual key server, dedicated to performing key generation, storage, and distribution. Keys should be generated with a FIPS 104-2 validated pseudo-random number generator and stored in a secure key database. Keys used for encrypting data (data encryption keys, or DEKs) should be key-wrapped and encrypted using key encryption keys (KEKs)--these keys are only used to encrypt DEKs inside the secure key database. Once encryption keys are generated and in use, they should be distributed for use over a secure Transport Layer Security (TLS) session using certificates to authenticate the user requesting the encryption key. An enterprise key management server should use the most recent, recommended version TLS--1.2--as vulnerabilities were discovered in TLS 1.1 and TLS 1.0. Lastly, enterprise key managers should perform real-time backup and high availability functions to prevent downtime and ensure business continuity. This means that each key server should perform active-active mirroring to one or more high availability server as well as perform routine, automated backups to secure storage drives. All of these functions are critical to meeting best practices and securing encryption keys. However, beyond the technology, an enterprise key manager should implement user rules and administrative options that enforce particular policies and policy-based best practices. A critical administrative component to encryption key management is the ability to manage the complete encryption key life cycle. 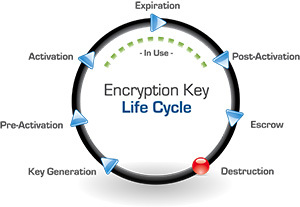 The encryption key lifecycle is defined by the National Institute of Standards and Technology (NIST), which outlines all aspects of a key’s life including key generation, pre-activation, activation, distribution, revocation, post-activation, backup, and deletion. The administrative console that allows access to these functions should also give the IT or security administrator the option to designate key users or user groups as well as set keys to automatically rotate after a certain number of days, months, or years. This is just one requirement for organizations who fall under security standards for some regulated industries such as the payment card industry. The Payment Card Industry Data Security Standard (PCI DSS) outlines key management requirements for card holders or processors that can typically only be met using an enterprise-level encryption key management solution. To learn more about PCI-DSS and encryption key management, view this webinar. Beyond managing the key lifecycle, an enterprise key manager should actively audit and log all activity and functions performed on the key management server and record these logs to an external event monitoring or logging server so that malicious activity can be detected in real time. Your key management solution should be compatible with common event monitoring solutions and export logs in standardized formats in real time. Lastly, your key management solution should inherently enforce policy-based security functions that meet key management best practices such as separation of duties and dual control. Separation of duties ensures that no single person is in control of multiple key management procedures such as the client request and subsequent distribution of an encryption key. The person requesting the key and the person distributing the key should be two different people. Dual control prevents any key management process to be controlled by a single person; for example, two security administrators should be needed to authenticate access to the key server. While these policy-based controls are sometimes optional, they should always be available and easy to implement in your encryption key management solution. When MongoDB decided to implement KMIP, the decision was likely a deliberate strategy to help users to either leverage the enterprise key management solution they already have, or to use common key management solutions that are KMIP-compatible. The power of KMIP is that it enables users to truly achieve centralized key management. A historical problem surrounding key management was the difficulty of an organization to store and manage encryption keys across multiple platforms, operating systems, and often departments. By implementing KMIP, MongoDB continues to make implementing key management across an organization more and more easy and effective, and therefore more user-friendly, which is what MongoDB is best known for. Without deploying a strong encryption key management solution, encryption of sensitive data on its own is considered ineffective. In the age of the cloud, deploying a key management solution alongside your data is equally important, and therefore having options for where you deploy it is an important factor in your key management strategy. An effective key management solution should not only be centralized across your organization, but it should meet your data where it’s at, whether that is the cloud, a virtual environment, or on-site hardware. KMIP also enables MongoDB customers to choose their own KMIP compliant key management solution and maintain complete custody of the key management server, and therefore the keys. Whether deploying the key manager in the cloud, in a virtual environment, or on-site, owning a third-party KMIP compliant key manager allows users to retain total control of their keys without sharing access with cloud service provides or software vendors. Lastly, when researching professional or enterprise key management solutions, check to see if the vendor has validated their solutions with NIST such as to the NIST FIPS 140-2 standard, uses standardized technology, and has been validated to meet PCI DSS or other regulatory certifications. These validations ensure that the technology has been tested by independent labs to the highest security standards. In combination with a robust database encryption solution from MongoDB, your encryption key management solution will elevate your security position and total level of control.